[rtl]The agenda of the session includes "voting on the draft financial administration law, the first reading of the draft law of the media and communications authority, the first reading of the draft law of the Supreme Iraqi Maritime Authority, and the first reading of the draft law of accession of the Republic of Iraq to the agreement of the Asian Investment Bank for infrastructure." It also includes the report and discussion of the draft industrial cities law, and the report and discussion of the draft law of the first amendment to the Integrity Commission Act No. 30 of 2011. (CPA) and under the laws and usages of war, and consistent with relevant U.N.
the full force and effect of law. force and effect of law. preparation and execution of the federal budget of Iraq, and in related issues. allocated and used for public expenditure according to the priorities of the government. money over the fiscal year for specified purposes. “Borrowings” are funds received in return for a legally binding agreement to repay. payments, transfers, and transactions in kind. executor, responsible for the execution of the budget. buildings, structures, machinery, and equipment, and financial assets. bank account or cash balance. binding agreement that will result in a payment. unforeseen at the time of passage of the annual budget law. items by type for the purposes of financial statistical reporting and analysis. (SDRs), treasury bills, and shares. and ends on December 31st. “Transitional Administration Law” or “TAL”). of public money belonging to the federal government. Number 71, Local Governmental Powers (the “Local Governmental Powers Law”). 24) “Line items” are the payments specifically itemized in the budget law. property, intangible property, or services rather than cash. expected to result in a future payment in cash or in kind. 27) “Outlay” means a payment to liquidate an obligation other than borrowing. 28) “Payment arrears” arise when a payment is not made by its due-for-payment date. natural gas liquids and refined petroleum products. a juridical person, functions independently and is capable of maintaining separate accounting. to which funding is allocated in the annual budget law. from one budget account, unit, or line item to another. executing, and reporting the budget. controlled by the Ministry of Finance and is maintained at the Central Bank. within the territory of Iraq. Government does not include public corporations. levied on petroleum (petroleum tax revenue). unrestricted website, or in widely available public newspapers. necessary to give effect to and implement this Law. guarantee contracts of the federal government. legislative authority for approval or adjustment pursuant to Article 33(C) of the TAL. for the fiscal year shall be passed by the regional governments. governments, including special budgetary funds. and duration of these commitments shall be limited as specified in the annual budget laws. transactions shall be entered into the Treasury’s General Ledger. accounts of the federal budget. These reports will be made publicly available. borrowings, domestic and external loans, or by the issuance of government debt securities. account, and reflected accordingly as receipts and transfers to and from the budget. Fund will be shown in the budget. obligations under any relevant UNSCRs or international law. of the Central Bank and such other individuals as the Council may deem appropriate. may not delegate to another person. 1483, or as otherwise decided by the UN Security Council. implemented or financed by external sources. spending unit to prepare its budget request. Estimates of receipts from the core activities of spending units. be included in the contingency reserve. proposal submitted by the Minister of Finance and approved by the Council of Ministers. these objectives relate to provisions in the annual budget law. general government for the past two years. Ministers with respect to this proposal. commitments, salaries, pensions, social security payments, and debt service. Gazette and made publicly available in other media, as appropriate. respect the operational independence of public corporations. and are not incorporated into the budgets of any other level of government. disclosed in the final accounts of the federal government. with international standards and shall be audited by an independent auditor. The Minister of Finance is responsible for the execution of the federal budget. spending plan that has been approved by the Minister of Finance. them, unless otherwise provided by the budget law. are used for lawful purposes. from the reserve will be reported to the body vested with national legislative authority. spending of up to 5% may be permitted with the approval of the Minster of Finance. year, except to the extent that goods and services have been validly ordered and received. approved by the Council of Ministers on a recommendation of the Minister of Finance. raised and loan guarantees issued. approved in the plan on the basis of macroeconomic and debt policy considerations. federal government, regional governments, governorates, and public corporations. governorates, but shall not guarantee them, unless explicitly provided in law. implementing all decisions on issues of securities. this information within 30 days of the end of each month. days of the end of each fiscal year and shall make this report available to the public. accounting, internal control, borrowing, and debt transactions associated with the budget. recording receipts, payments, and commitments. governments, governorates, municipal and local governments, and other budget entities. execution of budget revenue, expenditures, and financing for the half year ending June 30th. expenditures and financing of the budget. audit report to the body vested with national legislative authority by June 30th. n) Managing the operations of the Regional Treasury Offices. g) Making payments from the current and permanent reserves. and on amendments to this Law. the Board of Supreme Audit, according to the law. Supreme Audit in connection with the performance of its audit functions. continue to apply, to the extent consistent with this Law. effect for the fiscal year 2005 and subsequent years. with either the interim standards or international accounting standards. fiscal year until the budget is approved. any supplementary budgets for fiscal year 2004. “Bank” means a bank as defined under the Banking Law. “Minister” means the Minister of Finance acting in an official capacity. of wide circulation as specified by the Council of Ministers or its delegee. on the books of the government securities registrar. refund outstanding Government Debt Securities. the Central Bank of Iraq as the agent for the Government. (h ) any other condition not prohibited by law. Debt Securities for sale, such as by competitive auction and by subscription. Government Debt Securities into the public treasury or an authorized depositary. Securities in accordance with their terms and conditions using public funds. Securities and for the purpose of paying interest on those securities. deposit of public money, including the interest rate on amounts deposited. to provide him with any information about their activities under this Law. the Minister’s functions under this Law. Law, except the power to delegate, to any person within the Ministry of Finance. paragraph in the Official Publication. Council of Ministers or its delegee. years, taking into account projections for the budget. Government Debt Securities outstanding as of the date of the report. Law and that is inconsistent with this Law is hereby superseded. 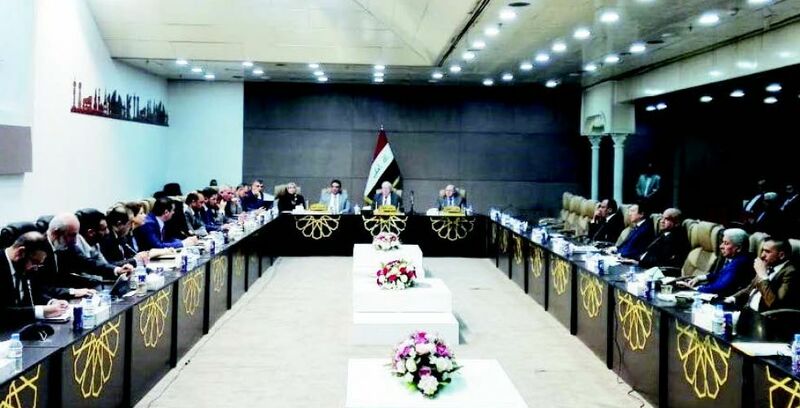 "Al-Kaabi chaired a meeting of the parliamentary finance committee to discuss the budget and oil of Kurdistan, and stressed the need to coordinate with the executive authority in the follow-up of the implementation of all articles and paragraphs of the General Budget Law 2019," the statement said. The statement added that "the meeting broke up the discussion of the draft laws within the jurisdiction of the Finance Committee, including the draft law on financial management, and addressed a set of issues most important was the oil exported from the Kurdistan Region, and rounds of oil licenses and review contracts and hosting ministers and officials within the Committee, and burning caravans at the port of Zurbatiya Wasit province "He said. The Finance Committee held a meeting on Tuesday 9/4/2019 headed by MP Haneen Al-Qado. The participants discussed a number of topics on the agenda, including the issue of oil exported from the Kurdistan Region and the draft law on financial management and burning of caravans in the port of Zurbatip Wasit province, as well as discuss the issue of the Iraqi Bank for Trade. The Parliamentary Finance Committee revealed on Thursday the intention of the government to launch the grades of the directorates of education in all provinces, noting that the postponement of the launch in the past period was caused by corruption and nepotism in receiving requests for appointments. Committee member Haneen al-Qaddu said in a statement to the "news" that "the federal government will launch appointments for the directorates of education in all provinces after the development of new mechanisms to prevent nepotism." He added that "postponement of the release of grades in the directorates came because of nepotism and corruption and political interference in the receipt of applications for appointments." He added that "the government will implement its promises on the disqualification of employees of electricity contracts and some state departments during the first half of this year," noting that "the restoration of their contracts in the security ministries need a supplementary budget." The Parliamentary Finance Committee on Thursday set a meeting date for all governors to find out the real reasons behind the disruption of the federal budget for 2019. The Committee member Siham Shannon said in a statement to the Information Center that "on Sunday of next week set for meeting all the governors to find out the real reasons behind the failure to implement the provisions of the federal budget in ten provinces," noting that "the meeting will include Kurdish conservatives and officials of the Ministry of Finance and Planning" . She added that "the Ministry of Planning informed the Finance Committee that only five provinces have submitted their plan and the disbursement of funds in full to implement the plans set," noting that "most of the provinces have not yet sent plans to ministries of planning and finance." She explained that "the meeting will resolve all those obstacles to the implementation of the budget fully without disrupting it for another period." A member of the Committee on Economy and Investment parliamentary Abdul Salam al-Maliki on Thursday, the most prominent laws that will be completed and priority of the work of the Committee during the coming period. "The investment sector is considered one of the most important sectors in support of the budget, so the legislation of the laws supporting it and able to attract foreign investor in the interest of the country in addition to strengthening the investment floor internally and end aspects of corruption exploited by the weak souls is The most important challenges we have in joint coordination with the executive authority. " He added that "there are many laws that began its legislative process through the completion of the first reading, in addition to the number of other has been completed, pending the presentation on the agenda of the meetings of the next parliament," pointing out that "the existence of five laws will be the priority of the current phase in order to complete the best Form the laws of industrial cities and mineral investment and companies and the law of the port of Faw as an investment opportunity in addition to the law of the Central Bank, which works on the Committee in coordination with the Finance Committee to complete it. On 20 March 2019, the MP of the parliamentary bloc, Haneen al-Qaddu, revealed the presence of 45 legal legislations within the parliament's corridors ready for completion during the second legislative term of the House of Representatives. Deputy speaks about the salary scale for state employees and describes it as "unfair"
said the legal committee member of the parliamentary Hussein punitive Thursday that the salary scale , as the current law "unjust and unfair" for a large segment of the Iraqi state employees, while noting that the current peace salaries can not be accepted and the Council of Ministers to reconsider its full . "We have seen two or more months ago a statement of opinion sent by the Council of Ministers to the Ministry of Finance to express its opinion on the old salary scale," he said in an interview with Alsumaria News. "The main point that the prime minister and government should pay attention to is that the current peace of salaries Is unfair and unfair to the right of a large segment of Iraq's employees in a number of official institutions. " Al-Aqabi said that "the old salary scale ensures a wide and significant difference in salaries between the segment and the other employees of the ministries." He pointed out that "the Constitution and the law clearly indicated the equality of Iraqis, especially as these represent public functions in the Iraqi state." "The current salary scale can not be accepted, and the cabinet must review it fully and take steps to ensure the fairness of all the employees of the Iraqi state according to the principle of equality." He stressed that "the possibility exists and there is a financial possibility to reconsider the salary ladder. He has to pay attention to his sons and save them from this difficult injustice. " 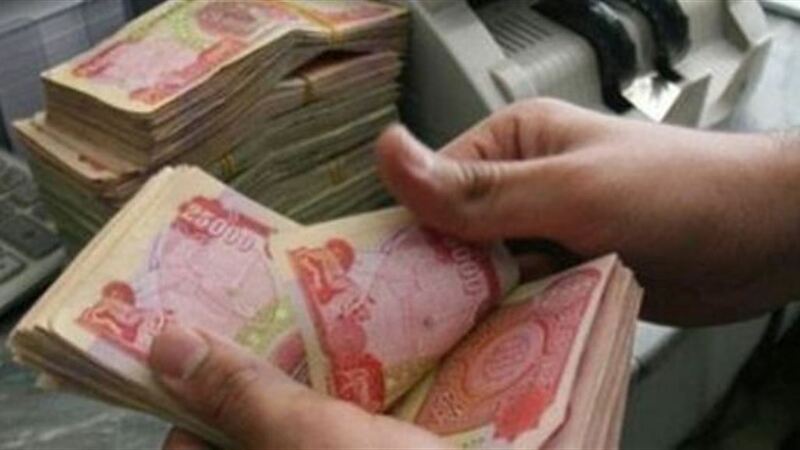 "The matter is linked to the government and is responsible for this file, especially that the text of the law of salaries of Iraqi state employees talked about the issue of the amendment and improve the salary scale to the Council of Ministers." On 10 April 2019, Rep. Hassan al-Juhaishi said that the current salary scale was unfair, pointing out that channels of dialogue would be opened with the government in order to encourage it to amend it. The head of the parliamentary finance committee Haneen Qaddo said on Sunday that the committee is working to determine the obstruction of completing projects and monitoring the performance of the provinces. "The Finance Committee hosted 11 governors to study and follow up the financial allocations to the budget of 2019," noting that "the Commission exchanged views with the Conservatives to find out the reasons for the delay of projects and the reality of achievement", said Qado said in a press conference in the House of Representatives with the participation of members of the committee and some governors attended by " . He added that "the committee is working to identify the obstruction of the completion of projects and control the performance of the provinces," stressing that "the Committee tried to find solutions to obstacles with the Ministry of Finance and some ministries of important projects." "The parliamentary finance decided to put in place new mechanisms for monitoring to reach substantive solutions in the coming months," Qadu said. The Parliamentary Finance Committee discussed the delay of the completion of projects in the provinces that suffer from poor services and discuss the reasons for non-launch of financial allocations to them despite being identified within the budget of 2019. The Committee held a consultative meeting expanded and followed «morning», headed by MP Haneen al-Qaddu, and included members of the Committee of Regions and Governorates irregular Karbala, Salah al-Din and the deputies of Diyala, Wasit, Kirkuk, Anbar and Muthanna Governor and head of the crisis cell in Nineveh province, in the presence of the Undersecretary of the Ministry of Finance and a number of general directors in the Ministries of Finance and Planning and the Secretariat of Baghdad. "This meeting comes within the efforts of the committee to find out the most important problems faced by the provinces and the obstacles that they face in the way of implementing their projects, which prevents the provision of the best services to citizens, as well as to follow up the budget of these provinces and what has been spent in Balancing the 2019 and finding a solution to the obstacles that appear with the government and the ministries concerned ». The meeting was opened by the head of the Finance Committee, MP Haneen al-Qado, in which he affirmed the committee's intention to exercise its supervisory and legislative role, follow up the ministries and governorates, and identify the reality and identify the most important projects that are stalled and stalled. He called on the provinces to submit schedules of stalled projects and explain the reasons behind them, to study them in the committee and follow up with the relevant ministries and relevant governmental bodies. The conservatives and their deputies presented separately on the most important problems facing their governorates, especially in the field of project financing and implementation of the budget paragraphs related to the provinces and overlapping of powers and disbursement of dues of contractors, as well as the resulting problems with the neighboring provinces administratively. The governors presented tables of the most important projects that are stalled and slow and have a direct impact on the lives of citizens and need quick action to complete them. While the Undersecretary of the Ministry of Finance and Directors General of the Ministries of Finance and Planning and the Secretariat of Baghdad answers to all questions and observations and questions of members of the Finance Committee and governors. For his part, said a member of the Finance Committee Thamer Deiban Al-Hamdani said in a statement to «morning»: «The meeting comes from the principle of follow-up plan for the budget of 2019, which was allocated good amounts on the grounds that there is a large space in contrast to previous years, as well as the rise in oil prices and the cessation of war On the urging, these conditions gave the parliament space to allocate good amounts for the development of regions in the provinces », noting that« there are projects have been idle and occupied during the past five years because of the financial crisis ». The meeting was held in the Finance Committee in the presence of all the governors of Iraq, except for the region, to find out the problems they suffer from. The presence of the Ministries of Finance and Planning was to be a joint action because these ministries are involved in financing the projects. Problems that have been raised by conservatives. " Al-Hamdani said that «this session, contrary to the previous sessions, wants to put this money within the priorities that are in the interest of the citizen on the grounds that there is a decline in services in all provinces, and that there is lag in some provinces have not been approved on their projects in the provincial councils, Those projects by the Council and the managers of the regions, but disabled in the corridors of the provinces ». In turn, Najaf Governor Luay al-Yasiri pointed out that «this meeting is a good step by the parliament and the governors to discuss the obstacles and accelerate the implementation of the budget items, especially that there are important projects, as there are ongoing projects do not need the approval of the Councils and must launch allocations to them». Al-Yasiri added that "there are new projects and the problem is on them, as the ongoing projects stalled and approved for months and new projects suffer from the allocations that should be launched to them," calling on «the Ministry of Finance to set a time limit in the launch of these allocations», «Most ministries have implemented projects in Najaf schools and others are suspended from 2012 to now because of corruption deals in time, and this file in the integrity». 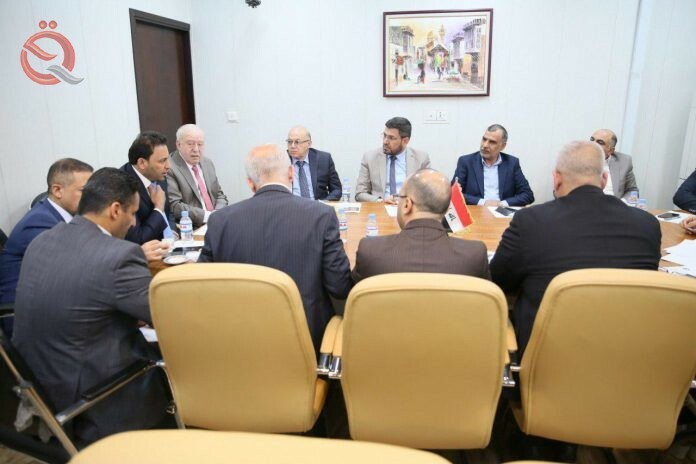 In the same context, discussed the Finance Committee on Monday at a meeting chaired by MP Haneen al-Qaddo with the head of the crisis cell in Nineveh province, Dr. Mizahim Khayat and his delegation, the subject of reconstruction of the province and to identify the most important obstacles in the way of reconstruction. The delegation presented the most important projects needed by the province, including roads, bridges, hospitals, universities and Mosul airport, as well as a summary of the most important projects ongoing, stalled and slow, and the meeting came out of recommendations and submitted to the presidency of the House of Representatives and ministers. The Finance Committee of the parliamentary, on Saturday, the end of the recent amendments to the Financial Management Law and vote on it early next May, indicating that the law obliges the government to submit final accounts for previous years. "The committee completed all amendments to the Financial Management Law and the first and second readings by the council," said Siham al-Aqili, a member of the committee. She added that "the presidency of the parliament gave the Committee a deadline to complete all amendments until the end of this month," noting that "the law will be submitted to the vote early May next." She explained that "the law in the event of adoption requires the government to submit all the final accounts of previous years that were not submitted to parliament by previous governments," noting that "one of the paragraphs of the law obliges the government to submit accounts for the coming years in January of each year." On the blessing of God held the Federal Financial Supervisory Board on Tuesday morning, 23/4/2019, the first meeting in the new building of the Federal Financial Supervisory Board. Dr. Salah Nouri Khalaf, Chairman of the Board, started the session welcoming the attendees, welcoming them to the opening of the new hall in the building. His Excellency congratulated the Directors-General of the Christian Brothers on the occasion of Easter and the Council discussed a number of paragraphs on its agenda to take appropriate decisions on them. The session was attended by members of the supervisory board.